Tunisian President Essebsi has vowed to soon submit a bill to parliament giving women and men equal inheritance rights. The country has long been seen as a pioneer for women's rights in the Arab world. 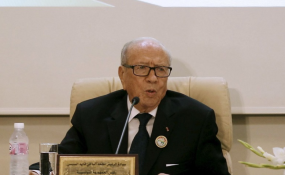 Tunisia's President Beji Caid Essebsi marked Women's Day in Tunisia on Monday with a speech in which he pledged to refer a law introducing equal inheritance rights for men and women to parliament in the near future. "I propose to make equal inheritance a law," he said in the televised speech, adding that "male and female citizens are equal before the law without discrimination." Currently, under the sharia or Islamic law as applied in Tunisia and in many other Muslim-majority countries, male heirs receive double the assets given to females of the same level of kinship. The proposal to establish inheritance equality is one of the most hotly contested of the social reforms put forward by a commission set up by Essebsi last year to review the country's rights laws. The commission, which has consulted with representatives of civil society and political parties, has also proposed decriminalizing homosexuality and abolishing the death penalty. A protest against the proposed reforms in the capital, Tunis, on Saturday drew thousands of people. A pro-equality demonstration is planned for Monday evening in the city center. Ever since it gained independence from France in 1956, Tunisia has been seen as progressive in implementing women's rights compared to other countries in the Muslim world. Last year, it passed a landmark law on violence against women, which went into force in January. The proposed equal inheritance law would be applied only when a last will and testament do not stipulate any preferences as to the division of the inheritance.